The Golden-Beard Penstemon is a member of the Snapdragon (or Figwort) Family. The plant grows to 4 feet in height and has gray-green, narrow leaves to 5 inches in length. It typically grows along roads and in oak and pine forests at elevations between 4000 and 10000 feet. The Golden-Beard Penstemon is also known as the hummingbird flower because it is pollinated by these birds. 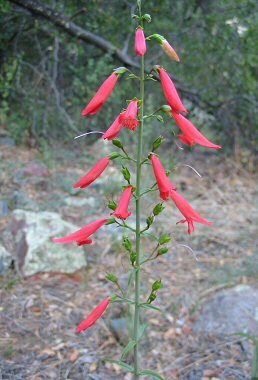 The Golden-Beard Penstemon blooms between June and October and produces red, tubular flowers to 1.5 inches in length which have a protruding upper lip and a lower lip that is bent backwards. Flowers usually grow on only one side of the stem.